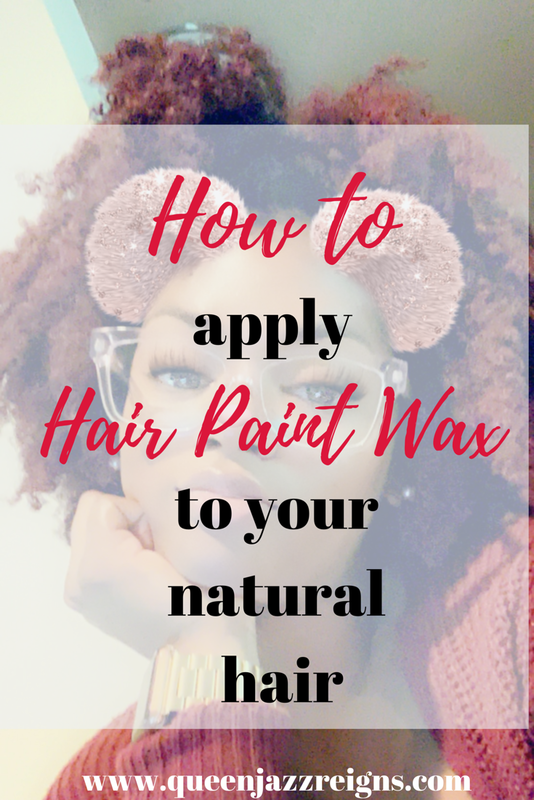 Have you heard of Hair Paint Wax? 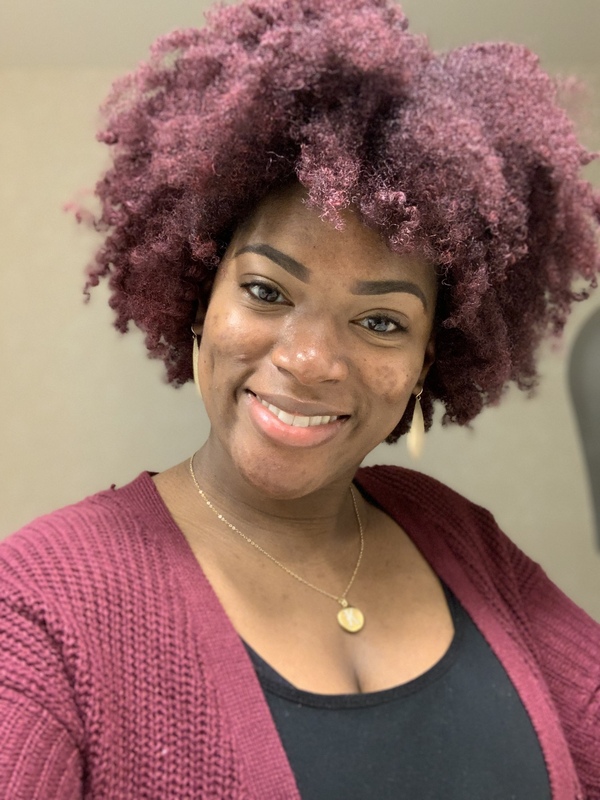 It’s pretty popular right now in the natural hair community on YouTube and Instagram. If you haven’t heard if it, here are the deets (details). A temporary water based hair coloring solution for those who want to try a new color every day of the week. Easy to apply, and easy to wash out, offers a strong hold with no damage to the hair. Best used for curly texture hair. Color may vary from person to person depending on hair texture and current hair color. 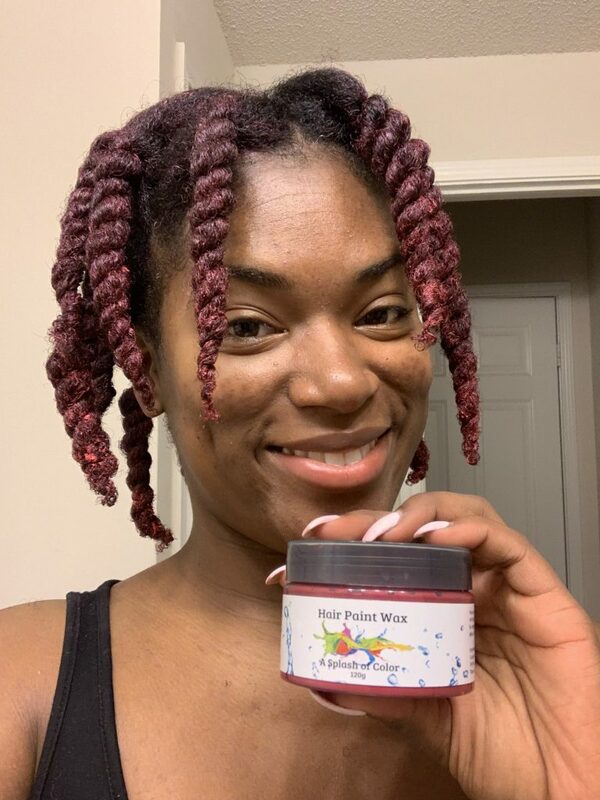 The website offers the hair paint wax in the following 12 colors: blue, green, gold, red, purple, silver, white, black, orange, yellow, aquamarine, pink, and a styler that doesn’t have color. The prices of the waxes range from $6.99 to $9.99. It’s been more than 5 years since I’ve had any permanent color in my hair. When I did experiment with color, my hair was extremely short so it’s a completely different ball game now. I wasn’t sure if I wanted permanent color again just yet and I’m not set on a color even if I did want to permanently dye my hair. (I’m not a natural who avoids all chemicals by the way). Can’t you tell? I decided to try the red coloring wax. I going to do blue, but I decided to hold off. There’s always next time right? I love that’s it’s not permanent so if I don’t like it then I can simply wash it out. This was such a smart idea!! I wouldn’t have to re-apply a black dye or rinse to fix it or worry with letting the dye sit and rinse and all that. This product was $6.99 and $5.00 shipping. I would suggest you buy more than one jar of hair Paint Wax to maximize the shipping cost. I personally don’t like paying for shipping, especially when it’s close or more than what I’m paying for my product. 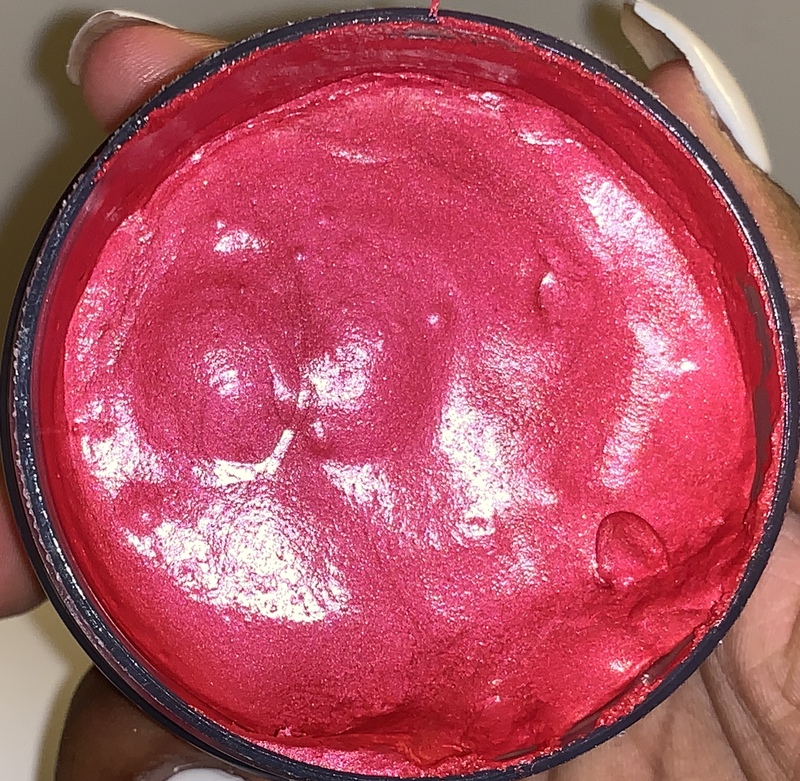 There’s another product on the market that’s similar to the Hair Paint Wax. It’s by MOFAJANG. They also offer multiple colors and if you have Amazon Prime, you won’t have to pay shipping. The cost of their products are $9.98. I think it’s worth a try since you’ll be paying more ($11.99) for Hair Paint Wax and you can get your product faster with 2 day shipping. Let me know what you think, if you try this! The product took 5 business days to get to me. I ordered it on a Sunday and the product was delivered on the following Friday. The website states 3-5 business days for processing so I’m impressed that the product was delivered within the “processing” time period. I was expecting processing to be maybe 4 days then shipping to be 3. USPS seems to take forever. Take a small amount of cream and spread evenly into the hair with both hands. Receive instant color change. I was a little heavy handed when I was applying to my hair. I used a about half of the jar. I wanted to make sure I got as much color as I could because it didn’t look very vibrant like I expected. To me it’s looks more of a purplish and I was expecting red. I have researched the harder and not so obvious ingredients, but as always do your own research as well. The product melted into my hair like butter. It felt really smooth and moisturizing. It also defined my curls very well. I could see a difference immediately after I detangled and applied it to a section. It took me about 30 minutes from start to finish. 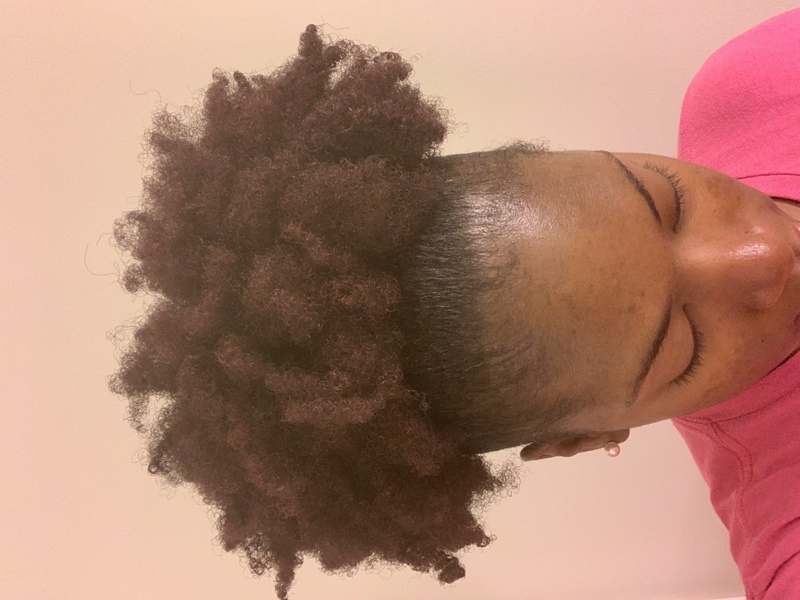 This included moisturizing my hair, detangling, apply the wax, and two strand twisting. I am not mad at that because if it were the traditional hair dye then I’d probably be sitting with the color on and waiting to wash it out. I let my hair air dry overnight and I put on an old bonnet that I wouldn’t mind getting the color all over. It wasn’t completely dry the next morning. But it still looked pretty decent. When I unraveled my two strand twist they were defined but still damp. I had to take them down because I had an errand to run. My hair was extremely defined though and it had a decent amount of hold. The color didn’t come out as bright as I would have liked. It’s more of a burgundy/purple color. I didn’t want to disturb the curls too much so I wore my hair in a fro and picked the roots a little. Let’s start with the cons. I’d already watched a couple of reviews on YouTube and knew that the color would transfer to clothing …particularly shirts if your hair touches it. I wore a black tank when applying it and by the time I was done, I had red speckles all over it. Even though my hair didn’t touch my shirt when I was applying it. When I took down my twists the next day, there was more transfer on my hands, which again, I expected. There was also some “fallout” on my shirt just like the day before when I was applying it. The fallout or speckles are kind of like when eyeshadow falls off your eyelids and onto your checks when applying. It was all over my shirt. The color transfer made me not want to style my hair. I had color on my ears and glasses (if I wore them) since my hair would be in a fro and my hair would cover my ears. I had to be conscious of randomly touching my hair. I had to make sure Kali didn’t touch my hair and then put her hands in her mouth. I was paranoid of my hair touching the couch, pillows, etc. without a bonnet or scarf on. It was a lot for me. The wax smells like a men’s product when applying it. It smells like Axe or men’s deodorant. Don’t get me wrong, I love how it smells (on my man), but I wasn’t expecting to smell like a man myself lol. The smell wears off though. I had white gel polish on my nails and after washing and scrubbing my nails multiple times, the red color would not come all the way off. It’s stained and I need to use nail polish or go to the salon to get my nails done over. Either or is okay with me since it’s time for me to go to the nail salon anyway, but if I had just gotten my nails done, I’d be pissed. That night I sprayed water on my hair to prep it for my twists. The wax transferred again and my hair felt dry and like I had a film on it, which makes sense. I’m going to rock the color until it fades or until the end of the week. I’m ready for my protective style (Marley twists). I think the color transfer is a huge con. I would prefer not to worry about subconsciously touching my hair, my daughter touching my hair, laying my head on a light colored surface, etc. It’s just too much. 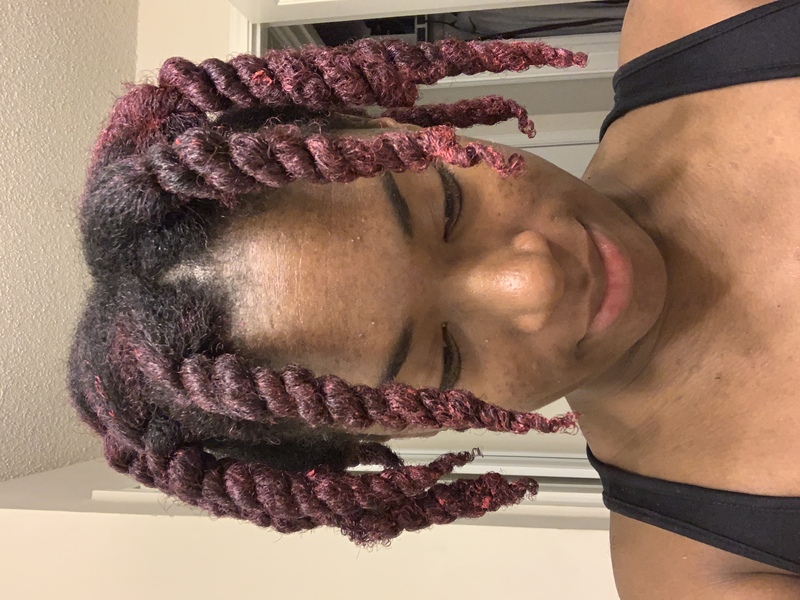 I also tried to do another twist out but wasn’t sure if I should add more water based products that I would normally use for a twist out. 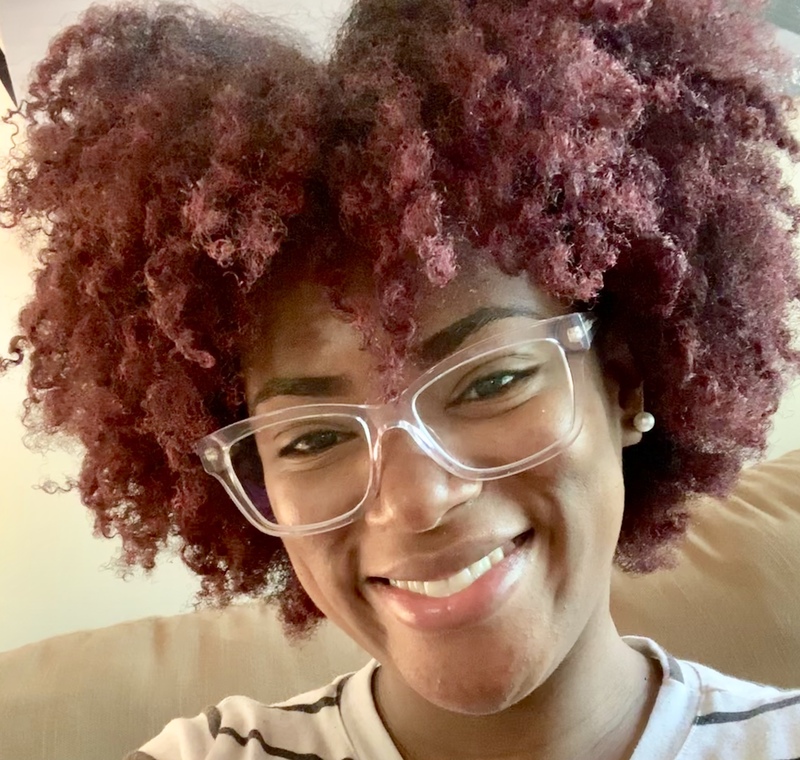 I still tried it and the twist out didn’t turn out with a lot of definition and of course it was super messy, but I won’t knock the product this time. I would use this product again, but for a shorter period of time. Maybe like a day or two. I like the color options and the fact that it washes out. Would you try this product? Maybe you have tried it already, what do you think about it?! Let’s talk about it.